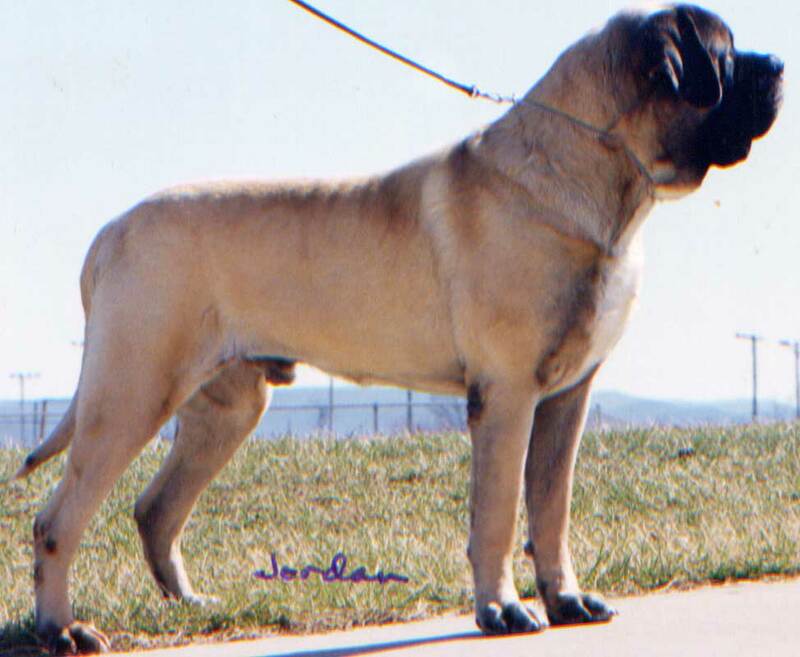 Remo was a very special mastiff. 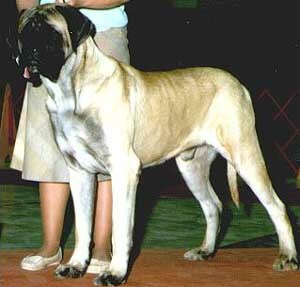 From the very beginning he was a spectacular specimen of the breed. We were quite grateful that we repeated the breeding of Ursa to Ezekiel. Even though we had already kept 2 males from the first litter, there was no way we were going to part with Remo. This is a picture of him as a puppy going Winners Dog. You can see that even at a young age he was very together. 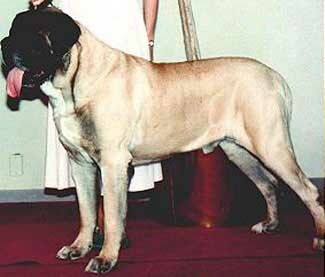 In 1988 Remo made the trip out to Washington for the Mastiff Club of America's National Specialty. The judge was Kenneth Buxton. 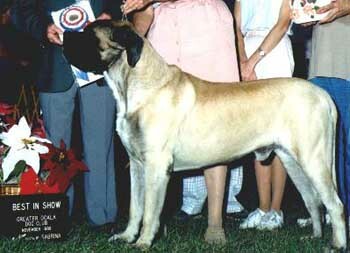 Remo had the honor of winning Best of Breed at the show, though he was only two years old at the time. Here is his picture from that event. 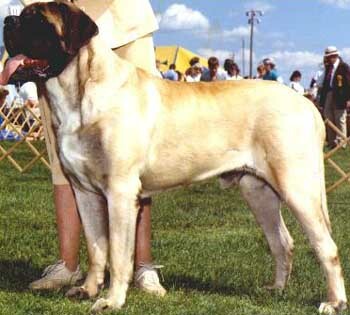 That same year at the National, Old School Mastiffs won "Breeder of the Year" (now called the "Breeders Cup") with their entry of Remo, Major (Ch. 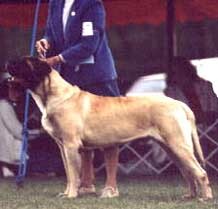 Old School's Majestic Major), and Mitra (Ch. Old School's Mitra Major). In 1989, Remo was the Grand Tournament winner at the MCOA National Specialty. The Tournament is a competition where three judges use the standard alone to score each dog. Here is Remo's Tournament picture. Remo won multiple Awards of Merit at MCOA National Specialties as well as Best Veteran. Here is a picture of Remo in his Award of Merit picture from the 1991 MCOA National Specialty. 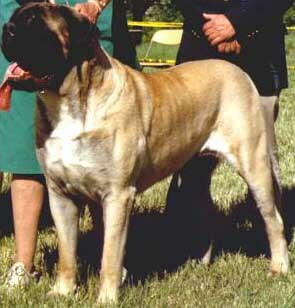 Remo does happen to be one of the handful of mastiffs ever to win an All-Breed Best in Show and a Best in Specialty show. 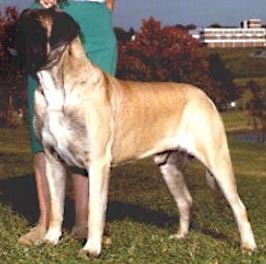 Remo's BIS came in 1988 at the supported entry of the Ocala Kennel Club show in Florida, a show that had a huge entry. Here is his picture from the event. It's not that flattering of a picture, since he is leaning back, but it's the only one so it'll have to do! Here is the picture from his Group One at that same show in Ocala, on the way to BIS. Remo was a multiple Group Placer despite his somewhat limited campaigning. This is a shot of Remo while he's in the show ring, being handled by Damara Bolte. 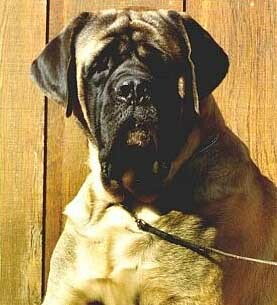 Remo was simply an all around excellent mastiff. 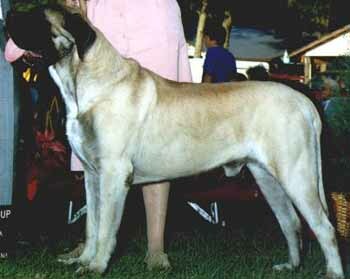 He was a very big dog, (230 pounds and 34 inches tall) but at the same time he was extremely sound. 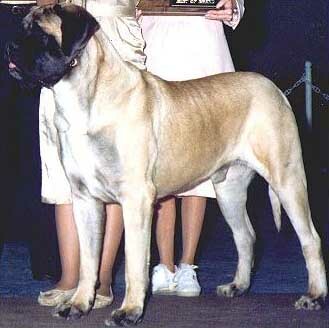 His movement was beautiful and powerful and it never ceased to amaze people that a dog so large could move so well. Add to that his excellent head type, body and bone, as well as his deep, broad chest and front, and his muscular, well angulated rear and is dark pigment and you can see how he was as popular as he was. We are extremely proud to be able to say that we bred, raised and owned this spectacular specimen of the breed. This picture of a more mature Remo, going Best of Breed at the supported Trenton KC show, shows him the way he is best remembered. And then, of course, there is the tongue... Remo was an extremely sweet boy, and we were lucky to have him for the time that we did. Remo was even popular enough to get on the cover of Dog World Magazine. This head shot from the Dog World photo shoot does a good job of showing Remo's excellent head type.